Early breakfast and pickup from your accommodation in Marrakech to start the adventure in an air-conditioned 4x4 or minibus. We cross the Atlas Mountains and the amazing Tizi-n-Tichka pass, having beautiful scenery on the way with photo opportunities. 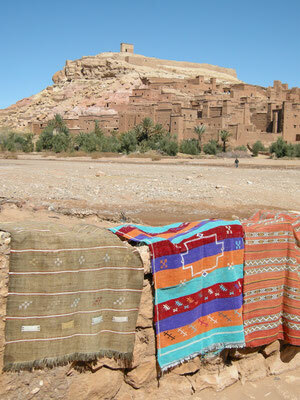 At lunch time we will arrive at Ait Ben Haddou, the UNESCO World Heritage Site since 1987. There will be some time to explore the fortified village (ksar), which is a great example of earthen clay architecture. After a delicious lunch (own cost) we continue our way to Ouarzazate, where we can also pay a short visit to the Kasbah Taourirte, where people from the Atlas, Drâa and Dadès Valleys have traded and socialized for centuries. After this short stop we head forward through the lovely green oasis of Agdz and the Drâa Valley to Zagora. 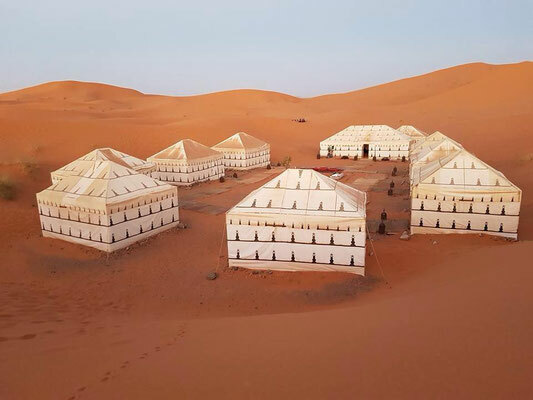 Here you will meet your camel caravan and set off on your camel into the Zagora Desert. The day ends with a dinner in a berber tent and nomad music at the open fire place under the starry sky - you will love it! If you want to admire the sunrise in the desert, you have to wake up early and climb on top of the dunes. It is really worth to get up early! After you enjoyed your breakfast at the camp, you ride your camel back to Zagora to meet the driver for your journey back to Marrakech. 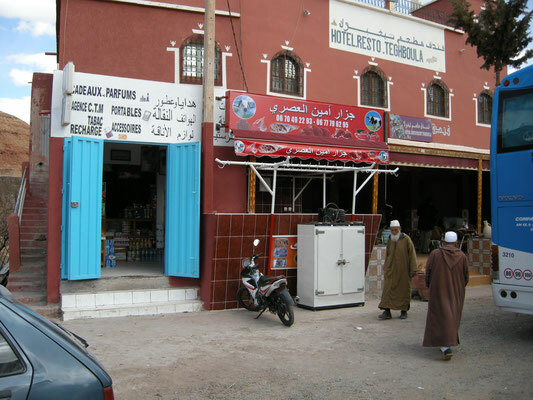 We will stop for refreshment, and have lunch in Ouarzazate. You will have some time to explore this city if you like or visit Kasbah Taourirte if you weren't able to do it the previous day. You will be back at your accommodation in Marrakech in the evening. Prices depend on number of persons. Please do not hesitate to contact us - we will submit your individual offer as quickly as possible. We will leave at about 8 am from your hotel in Marrakech and will be back next evening. Times are estimated and can vary according to season and the stops en route.